Why Choose a Reusable Cup? There are many reasons to choose to give this promotional product away as a gift. The most obvious one is the fact that this cup is doing the environment good, making sure there are less non evnironmentally safe products out there in the world. These cups once branded with your logo will be used again and again, making them an efficient way to promote your business by the client using this almost every day on their way to work or around the house. The brand Koffee Kups are quality drinkware at affordable prices. Call us for pricing - such a high perceived value product at such a low price. There are many different types of reusable coffee cup out on the market. The 2 most common coffee cups are made from PP Plastic with Silicone Branding Band, and the Ceramic Base Mug with the silicone branding band. Each are fantastic items, best chosen to correlate with whatever event or gift you plan on doing for that particular market. 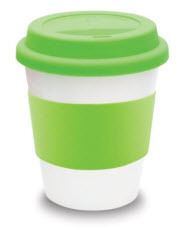 Our plastic coffee cups are double walled, leak resistant, ergonomically designed and environmentally friendly. The silicone branding bands come in so many different colours you are sure to find your own corporate colours.